One issue that I've been following for a number of years is so called MegaJournals. 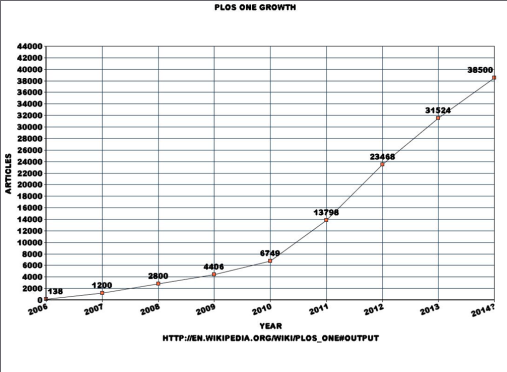 Cue ' Open Access and The Dramatic Growth of PLoS ONE' which I wrote for the fig share blog back in 2012. 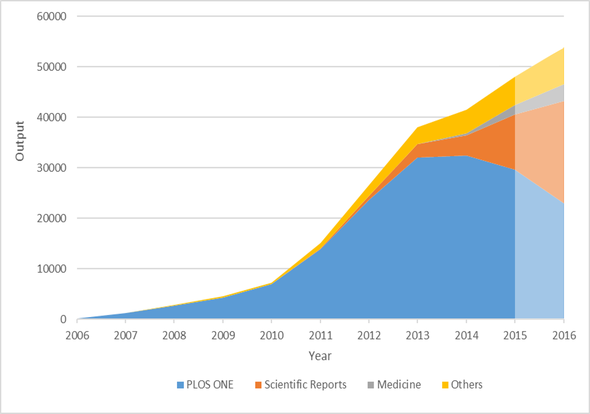 (As you will see, PLOS ONE started publishing papers in 2006). 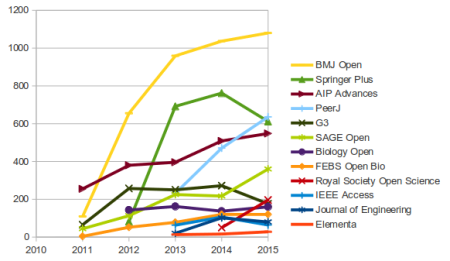 "Remarkably, PLoS ONE became the largest peer-reviewed journal in existence inside four years (and will publish as much as 1.5% of the articles indexed in PubMed in 2011), and over the past 12 months has been emulated by many other established publishers in various disciplines". 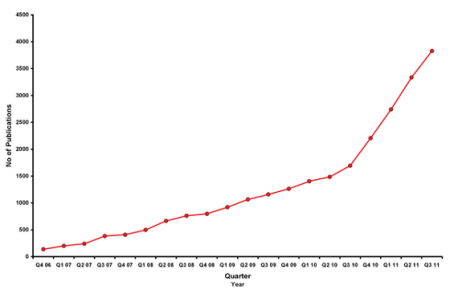 A large part of the reason for the spike in the dramatic rise since Q1 & Q2 2011 is the fact that that was the time that PLoS ONE received its first Impact Factor That opened the floodgates in a big way and it can clearly be seen from above that this fact has led to a significant effect. I was a bit disappointed that the paper didn't include a graph showing its conclusion, and asked about this (thanks to PeerJ's lightweight commenting system). Björk's response acknowledged that a graph would have been helpful, and invited me to go ahead and make one, since the underlying data is freely available. So using OpenOffice's cumbersome but adequate graphing facilities, I plotted the numbers from Björk's table 3. As we can see, the result for total megajournal publications upholds the conclusion that megajournals have peaked and started to decline. 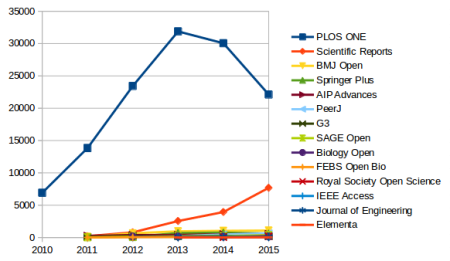 But PLOS ONE (the dark blue line) enormously dominates all the other megajournals, with Nature's Scientific Reports the only other publication to even be meaningfully visible on the graph. Since Scientific Reports seems to be still in the exponential phase of its growth and everything else is too low-volume to register, what we're really seeing here is just a decline in PLOS ONE volume. It's interesting to think about what the fall-off in PLOS ONE volume means, but it's certainly not the same thing as megajournals having topped out. So the establishment of new megajournals is very much a good thing, and their growth is to be encouraged. Many of the newer megajournals may well find (and I hate to admit this) that their submission rates increase when they're handed their first impact factor, as happened with PLOS ONE. 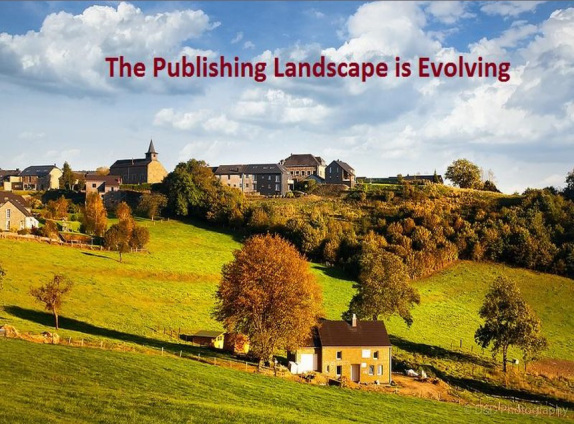 An unpredictable publication flow and revenue stream through APCs will have very different effects on the two publishers. Springer Nature has an enormous, diversified stable of journals and revenue streams, which allows them to play a long-term strategy game with Scientific Reports. Annual revenue fluctuations with one journal are not going to put Springer Nature in financial trouble. In contrast, PLOS' income is almost exclusively based on APC revenue, with 97% of their 2014 revenue coming from publication fees. More importantly, 91% of all 2015 papers published in PLOS journals were published in PLOS ONE, the remaining 9% split among six other journals. As revenue from PLOS ONE functions to subsidize the publication costs of these six other titles, downward pressure on PLOS ONE puts the entire organization at risk. 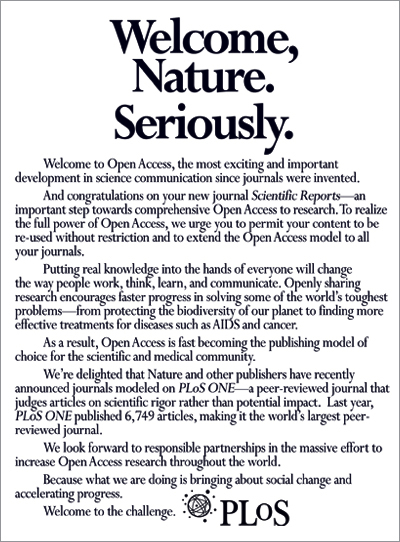 Nature' s new kid on the block is now the biggest journal in the world. 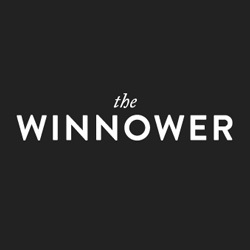 But while such giants are currently overturning the world of scholarly publishing, their long-term future is unclear, says Stephen Pinfield. 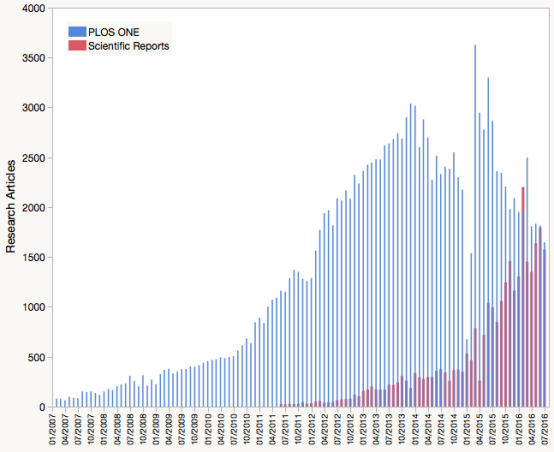 In September, Plos One was overtaken. 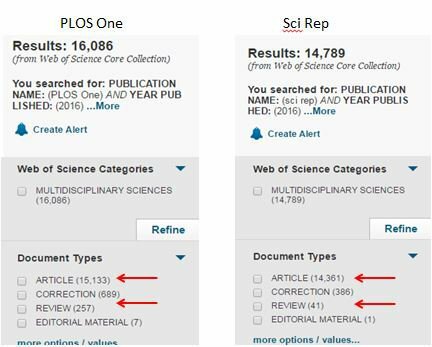 Nature's Scientific Reports published 1,940 research articles in that month, compared with Plos One's 1,756. The figures for August were 1,691 and 1,735, respectively. 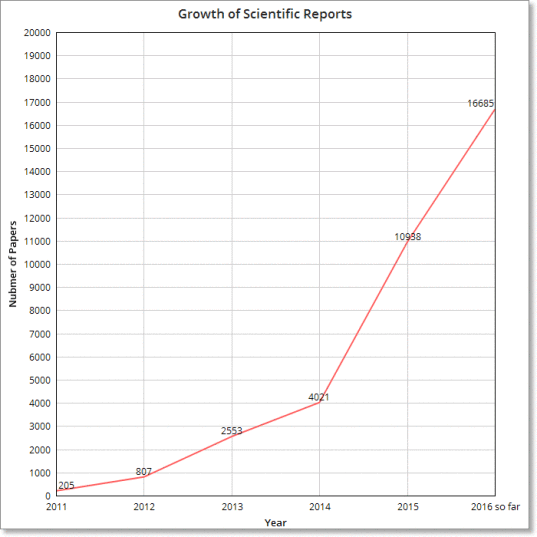 Scientific Reports has grown rapidly since its launch in 2011, a rise that has coincided with (some have suggested, partly contributed to) a decline in Plos One. Like Plos One, Scientific Reports publishes across STEM, although in reality, the former has more papers in health and life sciences and the latter in physical sciences. Pinfield's projected figures for SR in 2016 are based on data from August and September 2016. I them made the following graph based on data from here on SR.
After I tweeted details of Pinfield's post any my own graph, things got rather interesting on Twitter. Here's some of what I saw. 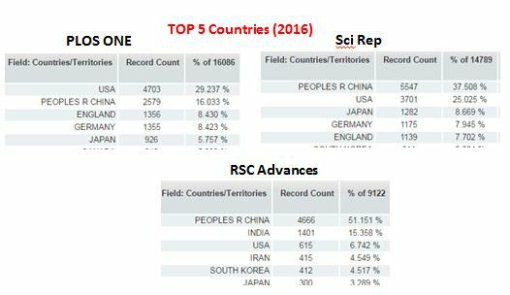 In summary, based upon available data, SR certainly appears to be on track to become the largest Journal in the world overtaking PLOS ONE but possibly not until early next year. What remains to be seen is whether mega-journals, as currently constituted, will prove to be a major innovation that contribute to the reshaping of research publishing in an increasingly open access world, or whether their real importance will lie in being a stepping stone to even more radical forms of scholarly communication. This will partly depend on the extent to which the open access "wild animal" will be domesticated. Signs of that already abound, meaning that any change is more likely to be incremental rather than disruptive. Nice re bhai app sotti. Get access to hack for generating paypal money and also get free gift cards and codes for using at paypal platform. Love paypal money generator share it.